The laser glasses that are sold on this site are very well priced and they are cool to wear according to my son and they work very well. The people at Dragon Lasers are top notch and very helpful. Going business with them is fast and easy and the time for shipment to me was reasonable considering they half a planet away. Bottom line with dragon lasers you in good hands they will take care of you. Today I received my laser glasses. Thank you very much for your high quality and fast assistance. It was a pleasure for me to recognize you company. The two glasses that I have are really good ! They work perfectcly, are confortable, nicely build and come with protection case and cleaning fabrics that are perfect. I put it in front of a 4w argon tube and they are still in perfect condition. It's a really good deal. The service was good, I wait for 12 days before I receiveit it, but the package was okai for the glass. I received my safety glasses quite timely and without any issue what-so-ever. The glasses themselves are incredible. I am using a rated 154mw green laser and almost all of the light was blocked out. You can only see a faint orange dot, which once was at the brightness level of the sun. This not only makes these a great pair of glasses for burninating matches, paper and balloons, but you can safely record colorful light shows to show all your friends. So, all n all.. well worth the purchase and my eyes will continue to function and thank me. Dragon lasers protective eye-wear (safety glasses) are perfect. It is amazing when you put the protective eye-wear on; all the leaser light seems to just disappear. This is not like putting on a pair of sunglasses; the focused reflected dot of a 400mW red laser off any surface is going to be bright, but with the protective eye-wear I can barely make out the smallest dot. Once I saw the difference I felt very confident that I am well protected, even against an accidental, momentary direct beam, and that is important when dealing with high powered lasers. 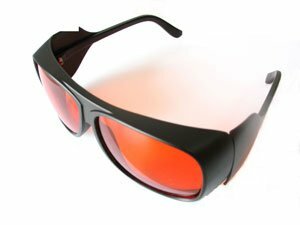 I am about to implement a 3.2Watt infrared laser into a laser etching project, and when it comes to focusing that beam I am very glad I have my Dragon laser infrared safety glasses. I needed professional quality, and that is what I got with Dragon Laser products. I have been building hobby laser systems for about a year before i upgraded to a few 100mw and 200mw CW lasers. Working with optics and lasers strong enough to be a health hazard it inevitably was time to find some proper safety gear. The first stop on the list was eye protection. I have shopped around from local to cheap imports from abroad and returned again to Dragonlasers for the safety of my eyes. They are well priced, had excellent coverage and in the frequencies i needed. I have purchased 2 types of protective eyeware for the frequencies i am working with and they have already likely saved at least one good eye. You can only mess up twice before you loose one of your best senses, or for about $30 you can keep both eyes, your call. I bought my 95mW Vipor green laser and safety glasses a few days ago and I have been impressed throughout all that time. The range on the laser is excellent and burning ability is good. The safety glasses help out allot. They do everything they are supposed to do. Safety Glasses are a must with lasers that are of high power. Dragonlasers have shown great honesty and respect towards their customers, and I have been impressed all the way through the buying process. Dragonlasers sell the best handheld lasers on the market compared to laser manufactures like wicked lasers and such. A special thanks to Frank for putting up with all the questions I had. These were pretty sweet. Exactly as I expected and perform amazingly. Thanx! I was very satisfied with the products and the time in which they arrived, I use them on regular basis as they aid in my laser related operations. I have advised these products to many others as they work really well. If anyone is after some laser safety goggles you cannot beat these for their quality and price.